The opportunity to work on J P Knight's new web site provided a reminder of an unorthodox start creative consultancy. Most of our new business comes from old business: existing clients referring us on. 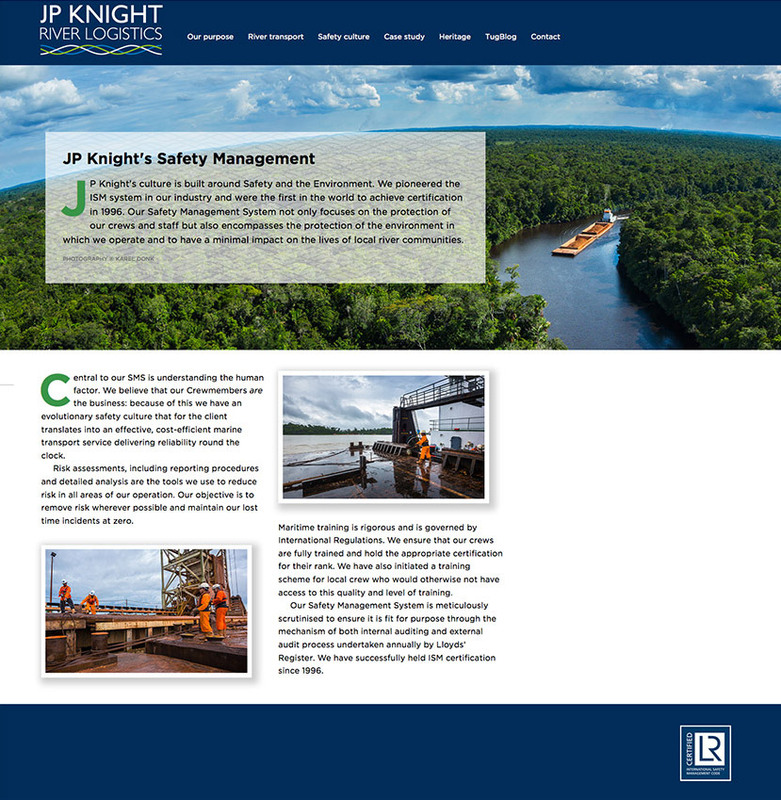 Recently Adrian Smith, the Chairman of ICP, recommended us to Richard Knight the Managing Director of J P Knight: a 122 year old barge company with a great European heritage and an increasingly significant business in other parts of the world. At the time I was little more than the office-runner. But what an office! I remember it being a traditional colonial building raised off the ground floor on pillars. The open space underneath the main structure had been given over to a menagerie collected from the gardens and the surrounding jungle. Thea Rubenstein, the agency’s founder, tended to all sorts of animals: some injured or unwell and in quarantine, others awaiting onward transfer to Chester Zoo. One of my first jobs involved looking after a Surinamese Boa Constrictor with a tic on its head the size of a gob-stopper. The opportunity to work on J P Knight’s new web site provided a welcome reminder of this unorthodox start in the business. Karel Donk’s stunning aerial photography features large throughout the site and although we’ve deliberately played down the heritage angle, in favour of current company direction, the history of the company still shines through. 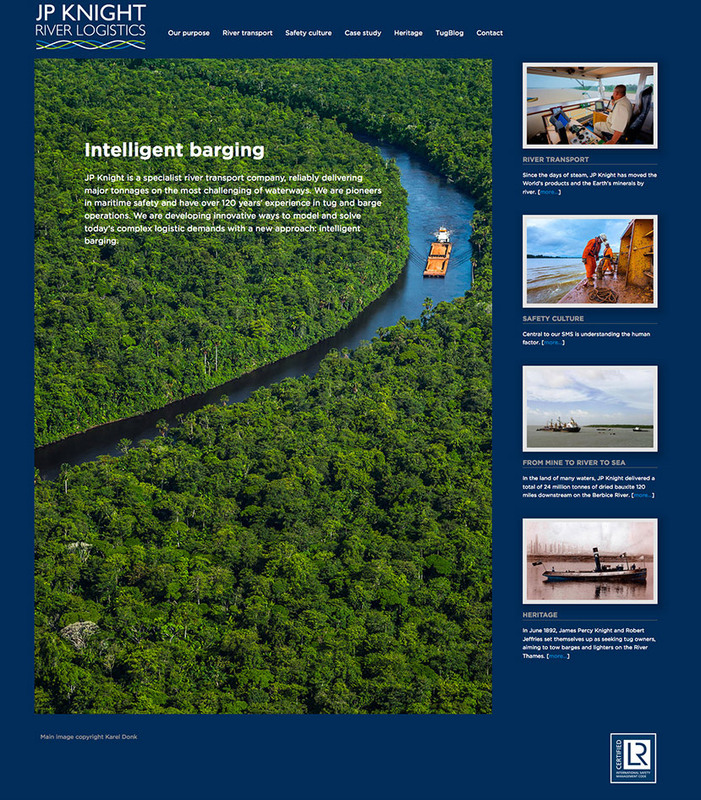 With a text written by Richard Knight, the new ‘responsive’ site is mobile friendly and for the first time allows J P Knight’s own people to update the content without having to rely on excessive external help. It has only been online for a relatively short time but J P knight acknowledge that it has already opened the door to new business for the company.